I still have quite a few odds and ends to take care of so I started this weekend with a trip to one of the local auto salvage yards. 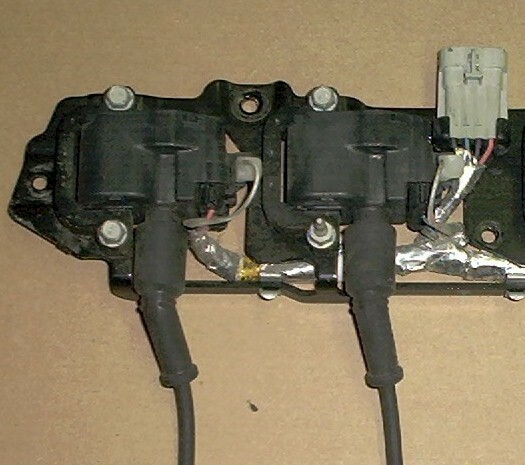 I had to look through several potential G-bodies for a nice lower AC/heater shroud to replace mine which was damaged during the first test fittings of the LS1 and eventually found a suitable donor car. When I got home I yanked out the engine and trans (hopefully for the last time!) so that it will be easier for me to install the clutch master cylinder and degrease and paint the frame/engine bay. My prototype clutch pedal needed several final passes with the welder to be complete. I finished these welds and then I ground down the welds to make a nice smooth finish prior to metal prep and paint. There are quite a few loose parts by now requiring paint so I decided to do them all at once. 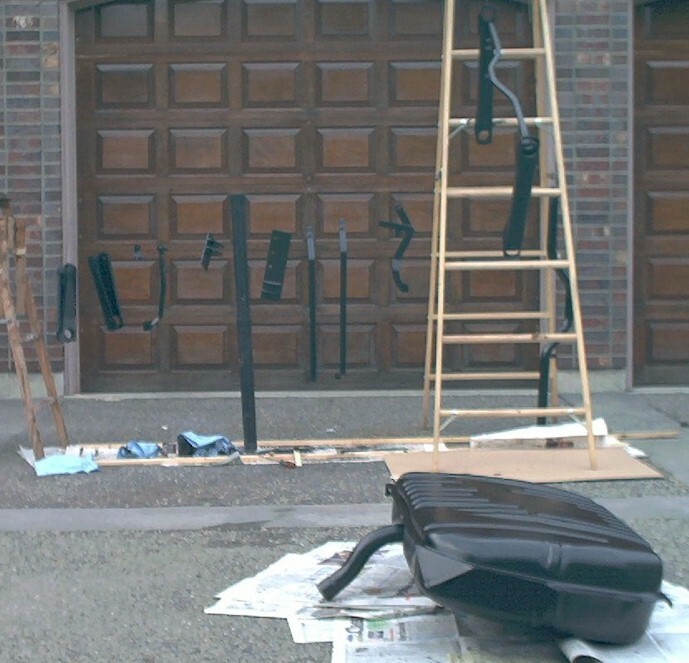 This pic shows all of the parts hanging along my temporary "wire clothesline" between ladders drying from L to R: upper rear control arms, clutch/starter solenoid bracket, brake pedal, LH Crossmember bracket, RH Crossmember bracket, the two gas tank holding straps, clutch pedal, lower rear control arms w/sway bar, Crossmember, and gas tank in the foreground. 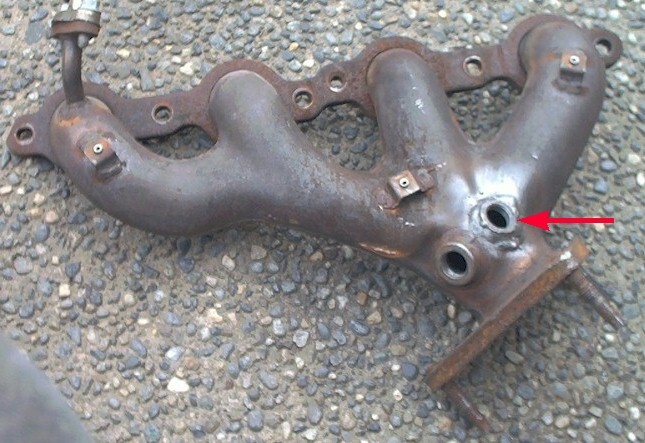 The drivers side LS1 exhaust manifold needs the oxygen sensor relocated. I bought a new Oxygen Sensor Bung at a local exhaust shop and carefully drilled and then reamed out a 1" diameter hole in the exhaust manifold to place the new Bung in the proper orientation (roughly 90 degrees from the OEM location) to clear the frame. It was a little bit of a pain due to fit up due to the contours of the manifold here but easy to weld with the MIG welder. This view shows the new bung location (with the red arrow) after I welded it in place. I will find a pipe plug to cap off the OEM bung to prevent exhaust leakage. One of the last fitment issues (besides the A/C compressor) is the passenger side coil bracket. This will be my next focus. I reworked the passenger side coil bracket to re-orient the #8 ignition coil and also trimmed the end of the coil bracket for additional clearance at the AC/heater shroud. 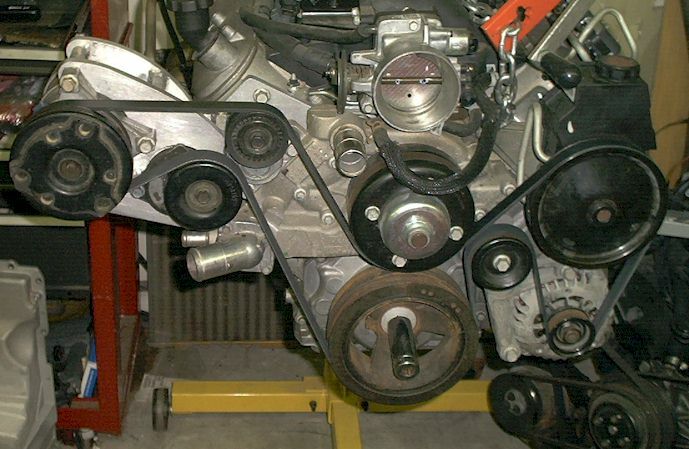 This view depicts the stock location of the #8 coil as mounted on the OEM coil bracket. 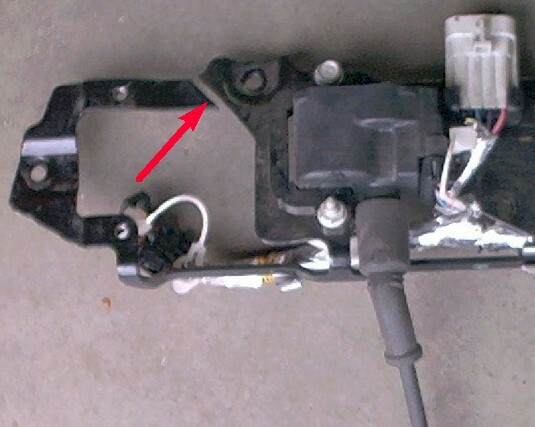 The red arrow in this view indicates the first cut I made to start modifying the coil bracket. 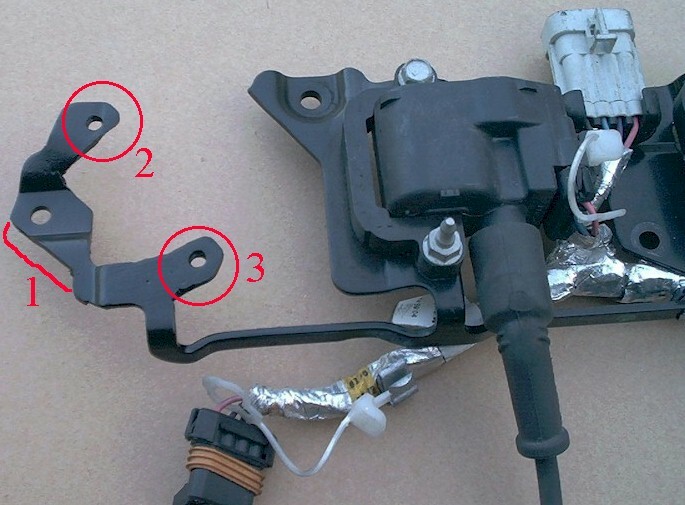 This pic has the area (1) outlined on the left end of the bracket shows where the metal was removed for additional AC/heater shroud clearance with the arrow (2) showing the modified area for the upper coil bolt mounting hole (and material removed all the way to the first cut) and arrow (3) showing where material was added for the new lower coil bolt mounting hole. This combined pic compares the old bracket in the top half of the photo versus the new modified set-up in the bottom half of the picture. 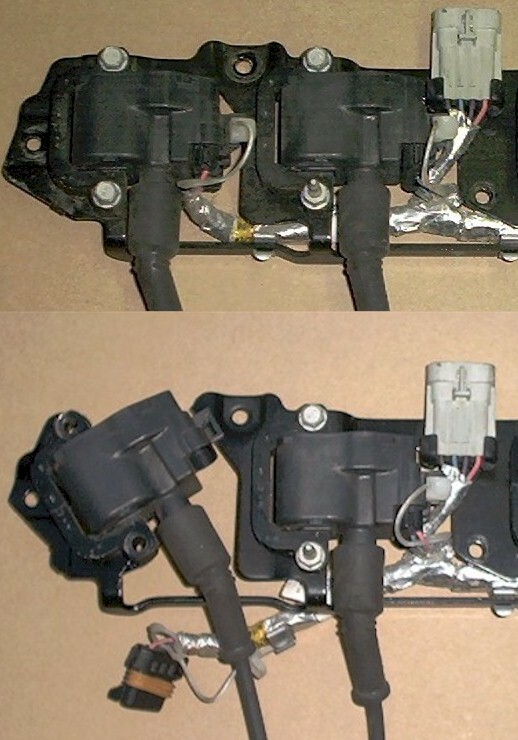 The ignition wire will need to be replaced with about a 1" longer wire due to the clocked orientation of the coil. Hopefully when I put the motor back in the car the clearance should be more than adequate based on my preliminary measurements. With all of the piece parts painted I moved on to resolve the last major fit-up problem, the A/C compressor. I focusing on validating the best of two locations for the A/C compressor, the stock down low location and a raised one next to the front passenger side cylinder head. 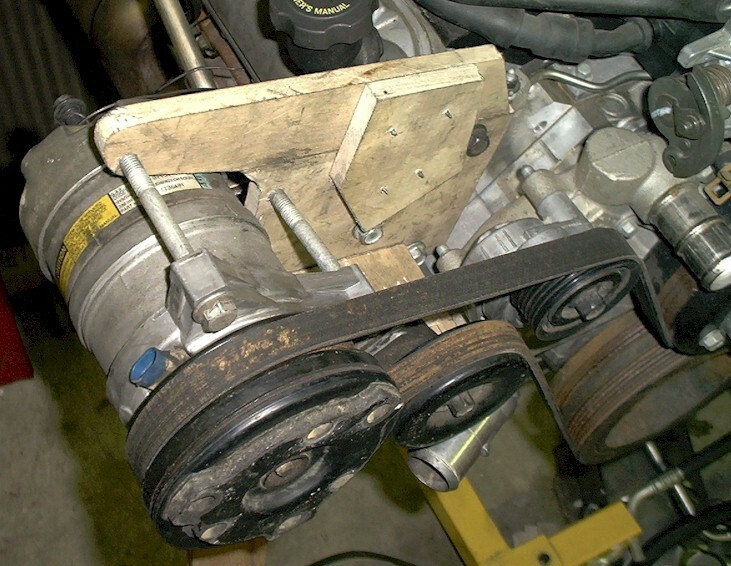 With the stock LS1 F-body bracketry, I tried to move the assembly forward to clear the engine Crossmember saddle which would require an additional pulley attached to the harmonic balancer. I couldn't get this to work to my satisfaction and clear the idler arm attachment at the frame. Next option I looked at was raising the entire compressor assembly to valve cover level on the passenger side. The LS1 F-body bracketry really didn't lend itself to this. I then selected an LT1 A/C compressor from a 1995 F-body set-up to use for mock-up purposes since the mounting bracket is located directly behind the pulley itself and will enable a flush attachment to a mounting plate. I chose to remove the EGR valve where it is bolted to the cylinder head for the mounting bracket location. The final modified version of my motor will eventually use the LS6 intake manifold which does not use the EGR system anyway. 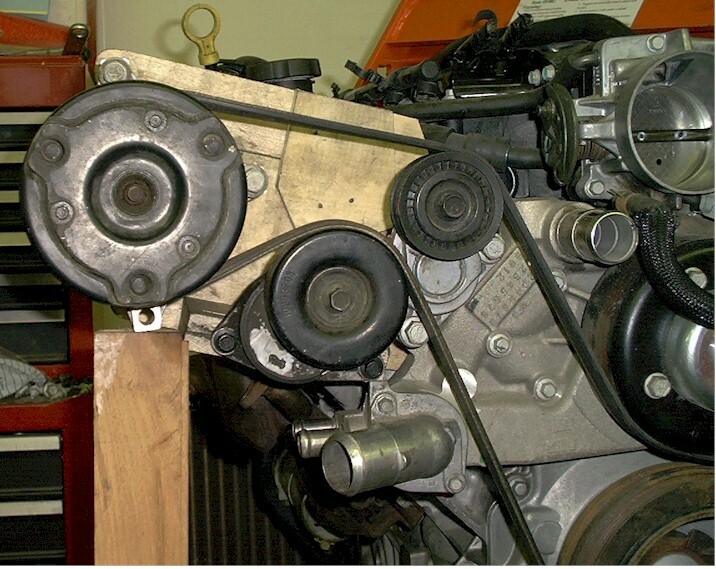 This top view shows how I mocked up a temporary wooden bracket plate to verify compressor height, clearance and belt alignment also using the '95 LT1 belt tensioner (located next to the A/C compressor). Here is a front view. After verifying fitment, I used thin cardboard to trace the wooden plate and actually drop the compressor 1-1/2" for better clearance with the Fuel Rail Cover. I will actually construct a bracket using a front and rear segment made of 1/2" T6061 T6 aluminum plate to ensure adequate strength (I know this is overkill but better safe than sorry!). I dropped of my templates with a local fabricator to Waterjet cut the pieces prior to assembly and welding. These parts should be ready by the middle of next week. I assembled all of the 1LE bushings into the control arms and installed the 8.5" rear end. Here is a view of the final installed unit. I finished stripping etching the engine compartment frame rails and proceeded to prime and paint with a satin finish black for a nice OEM appearance. I stopped by another local wrecking yard this weekend to pick up a mid '80s Olds G-body A/C compressor hose assembly and condenser with the passenger side fittings for proper connection to the newly located A/C compressor. I am ready to begin final fitment of the fuel system on the frame, however, I want to blueprint the fuel system to eliminate any possible restriction points prior to final installation. In reviewing the fuel system I noticed the nominal size of the 3/8" O.D. (9/32" I.D.) tubing necks down to 1/4" I.D. 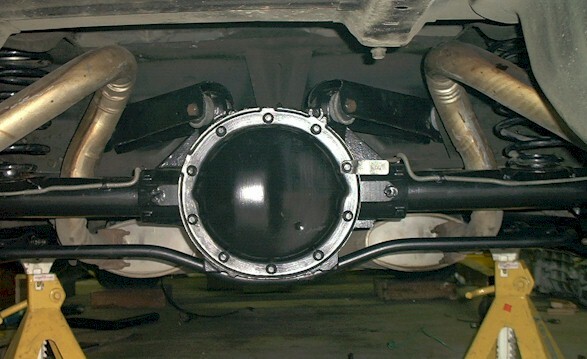 in several places due to the "bump tube" OEM fitting set-up. I elected to replace the recently completed front "bump tube" fitting which will connect to the fuel rail via a stainless steel flex line with another -6 fitting soldered on. I also replaced the fuel return fitting in this same location with a -5 fitting. Total cost here was an earthshaking $13 with labor but worth much more due to the alleviation of possible fuel restriction in the future when the motor is modified! I drilled out the "bump tube" fittings at the fuel filter from 1/4" to 9/32" and also drilled up the fitting at the fuel sending unit located at the gas tank to ensure no restriction. The fuel filter I will use is the standard TBI replacement filter which is also used in the GN/TR installations and will locate next to the front of the driver side rear lower control arm. Not much progress to report this week. The aluminum bracket pieces were finally cut this week ready for preliminary fit-up. I ran into a few minor fit-up issues trying to put the pieces together. Some additional clearancing around the idler pulley tensioner was required as well as around the water pump. Fortunately aluminum is easy to work with, especially with a sawz-all and die grinder! 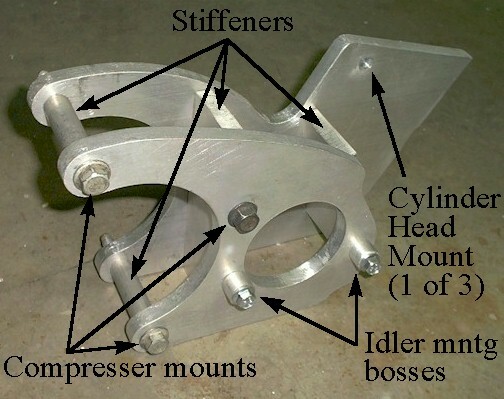 This view shows the preliminary fit-up of the pieces into a bracket assembly prior to welding. I labeled it for ease of understanding the pieces. I will take the pieces to the welder this week. All fabrication efforts for engine/trans fitment are now complete except for the air intake ducting! Unfortunately I don't think my June end goal for firing the motor up will be met :>( Hopefully I can get things close by July 9th since I will be out of town for 3 weeks after that date. Picked up the completed weldment tonight from the welder. I bolted up the bracket to the cylinder head and installed both the compressor and idler tensioner to verify fitment. Looking good! I bought a 100" long Gates 6 rib serpentine belt (stock '99 LS1 is about 79.5") and verified belt travel path and tensioner position. Both were excellent! Here's a pic of the completed installation on the motor. For those that may believe that the new set-up weighs too much compared to the OEM set-up the weight difference is only 5 lbs. (23 lbs. vs.18 lbs. when weighing the compressor & bracket). This difference in weight includes the idler tensioner mounted on my new set-up. Next step will be to clean up the bracket and bead blast it for a nice dull sheen finish. Following the bracket completion it will be on to the fuel lines, fuel pump and gas tank for final installation!